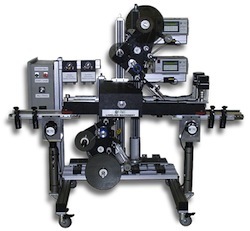 Whether you are in the pharmaceutical industry, cosmetics business, or any other type of vertical market that requires a labeling system for front and back labels, top and bottom labeling or wrap systems, you could benefit from automatic label applicators for their ability to be flexible and highly productive relative to volume output. With so many types of automatic label applicators now available, it may seem difficult to know which one would work best for your particular industry and specific product line. Here’s a bit of insight on three applicators that you may want to consider. The AccuWrap Wrap Labeling System is a line of equipment that is designed to wrap pressure sensitive labels around round-shaped products. By adding a modified wrap station and pressure plate, the machine can also label square and oval containers. The system can be customized with a many options to suit your particular needs, including in-feed handling devices, high speed drive packages, and bottle inspection systems. Benefits for this particular system involve making adjustments to labels and label placement without interrupting the machine’s operation as well as tool-less label changeover and minor adjustments. The Pharma Wrap Labeling System has been designed with the pharmaceutical and health care industries in mind. To meet stringent requirements, this automatic label applicators system has been built to the most rigid standards. It includes an extended applicator arm for mounting coders and inspection devices. The in-feed section of the conveyor is flat-sided so that rotary tables and tray feeders can be easily integrated. Additionally, the out-feed of the conveyor has been extended to accept an eject station and product verification systems. The standard mounting arm can hold such additional items as an optional hot stamp or thermal transfer coder, bar code reader, inspection camera and strobe light. The Automatic Top and Bottom Labeling System comes in a wide range of formats, Including complete systems that include conveyors and transport belts or semi-automatic top or bottom labelers.. To assist some applications within the food industry, top and bottom conveyor systems can help by using a labeling head that is mounted over top for the top label and then another label that is fed up through a small gap in the conveyors to apply the label up and onto the bottom of the product. Generally the conveyor system is used for more pliable containers. Another option is a dual hugger belt system, which works effectively for those small rigid container products that are too unstable to be transported and labeled on a conveyor by using dual hugger belts to keep the product in place for proper top and bottom label application. The semi-automatic top or bottom labelers use a base and platform that have labeling heads mounted on a stand so that labels can be affixed to the top or bottom of a product. The AccuWrap Wrap Labeling System is effective for pressure sensitive labels for round, square, and oval containers. The Pharma Wrap Labeling System is designed for the pharmaceutical and health care industries. The Automatic Top and Bottom Labeling Systems comes in any formats to handle all types of products that require top and bottom labels, especially those within the food and consumer goods industries. Posted in Case Labeling, Label Coders, Labels & Labeling, Laser Printing and tagged Automatic Label Applicator Machines, Automatic Label Applicators, Case Labeling Machines, label applicators, Labeling Machine.